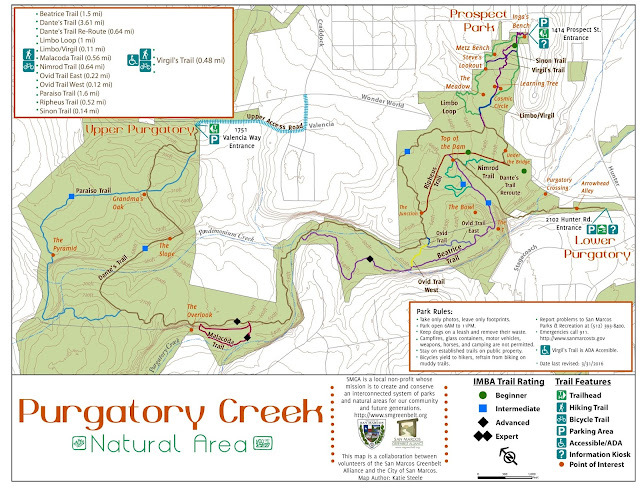 There’s still a lot of work to be done in Lower Purgatory Creek Natural Area following the October 30, 2015 flood. A new, temporary map reflects the changes in the Dante Trail below the spillway. Rather than paralleling the Wonder World overpass the trail turns left and heads to the backside of the dam. Unfortunately, this crosses private property. A re-route of the trail is being designed but will take months to complete. Dante connects with Ripheus at the top of the dam and spillway until it reconnects at the Junction. Dante is still the major trail through the natural area but is no longer 4.1 miles but 3.6 miles. Dante’s Trail in Lower Purgatory at 2102 Hunter Road has changed due to the flood.